In September 2017, my long-time associate, Chris Mackin, and I did a speaking tour on ESOPs in Sweden hosted by the filmmaker, Patrik Witkowsky, the to-be-lawyer, Mattias Göthberg, and the labor-oriented think tank, Katalyst. 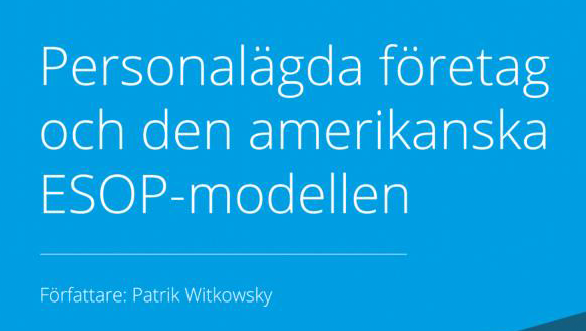 Afterwards, Patrik wrote a report, here translated into English, introducing the ESOP idea to a larger Swedish audience and describing the US experience. Patrik’s work on the report was funded by a grant from John Menke, a long-time ESOP advocate in the US. This is an example of the sort of initiative that is needed in Europe and elsewhere to spread the form of worker ownership that has been so successful in the US in the last 40 years. Click here to download the English translation. Click here to download the Swedish original.